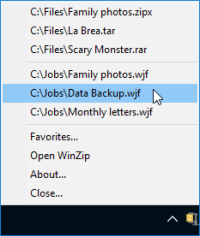 When installed on Windows 10, Windows 8, or Windows 7, WinZip allows you to easily access your recently used Zip files and WinZip features using Jump Lists (this does not apply to versions earlier than WinZip 14.0). The WinZip jump list can be used from the Desktop taskbar (or from Start with Windows 7 and Windows 10). If you like using either jump list, you can pin it so that it will always be available. Please see the topic entitled WinZip and Jump Lists in the Miscellaneous section of WinZip Help for more detailed information. The help topic includes steps for using various jump list features, how to control the number of items listed on jump lists, and how to clear jump lists of entries. WinZip versions earlier than WinZip 14 install the WinZip Quick Pick taskbar tray icon by default. Placed in the Windows Startup folder, Quick Pick is loaded and ready for use each time you restart your computer. Using Quick Pick, you can quickly and easily do many of the things listed above for jump lists. Additionally, Quick Pick can quickly open WinZip Favorites, WinZip Help, and the About WinZip dialog. The Quick Pick icon can be configured for use with Windows 10, Windows 8, or Windows 7 if you wish. It can also be removed temporarily or permanently (with any supported operating system). Quick Pick is completely optional--you can use it or not, as you wish.